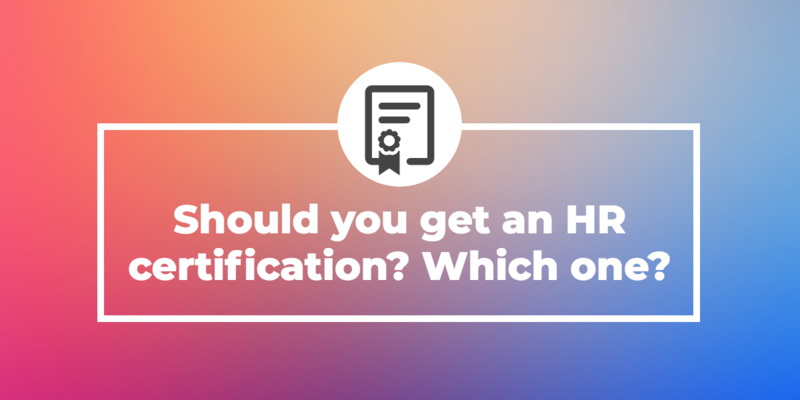 Should you get an HR certification? Which one? As a busy HR professional, finding time for career development can be challenging. While there are plenty of HR certification programs available, you may find yourself wondering if they’re worth the energy. After all, with so much on your plate, the last thing you want to do is commit yourself to an unnecessary burden. What are the advantages of HR certifications? Earning a certification requires an investment of time (such as the hours spent preparing for and completing an exam) and money (including exam and application fees). But the return is often well worth the energy and expense. Become more hireable. Some employers require applicants to complete a certification to qualify for a job — but even if a certification isn’t mandatory, it can give you an edge over other candidates. Being certified helps prove you’re dedicated to your profession and have the necessary knowledge to excel in the role. Increase salary potential. Certified HR professionals earn significantly more than their uncertified counterparts, according to data from PayScale. For example, those with the SPHR certification make 93 percent more money overall (an average salary of $87,900) than those without a certification (an average salary of $45,600). Advance your career. Completing a certification can improve your employer’s perception of you, which can translate into a promotion. Having a certificate will automatically qualify you for additional responsibilities when compared with someone who is uncertified. It can also help you negotiate a better title and a higher salary when looking for new opportunities. Develop and enhance essential skills. As an HR professional, you know better than anyone how advancing knowledge and skills can help improve job performance. Earning a certification will help you brush up on relevant topics and technology and ensure you’re up-to-date on the latest HR industry trends. Who should look into getting certified? While you’re not required to earn an HR certification to work in the industry, there are several circumstances when having a certificate can help you add value in your current role or make you more appealing to potential employers. Recent HR graduates entering the job market. Landing your first job out of college can be difficult, but having a certification can help you stand out from fellow applicants and ensure your resume rises to the top of the stack. Professionals working their first HR role. Whether you’re working your first professional job or you switched to HR from a different career, it’s normal to feel slightly overwhelmed in a new position. Completing a certification can help you build the skills you need to become more efficient, effective and confident in your abilities. Experienced HR professionals looking to boost their career. If you’ve been working in HR for a while and you’re ready to advance to a higher position, obtaining an HR certification can help. Not only will it prepare you by making sure you’re qualified for new responsibilities, but it can also give you leverage when asking your employer for a raise or promotion. Certified professionals seeking to move up. If you already have a PHR (Professional in Human Resources) certification and want to take your career and earning potential to the next level, you may want to consider getting the higher level SPHR (Senior Professional in Human Resources) certification. HR pros with an SPHR make 49 percent more than those who stop at the PHR. What are the best HR certification programs? Two different organizations offer HR certifications recognized as an industry standard: the HR Certification Institute and the SHRM (Society for Human Resource Management). aPHR (Associate Professional in Human Resources) is the best choice for someone who is a new HR professional, or someone who is considering a career in HR but has little-to-no industry experience. PHR (Professional in Human Resources) is the right choice for someone who has 1-3 years of experience as an HR professional and at least a Bachelor’s degree, or four or more years of experience without a Bachelor’s degree. SPHR (Senior Professional in Human Resources) is a good option for those with 4-5 years of industry experience and a Bachelor’s degree, or at least seven years of experience without a Bachelor’s degree. PHRi (Professional in Human Resources International) is the right selection for someone who has at least 1-2 years of professional-level experience in an HR role and a Master’s degree, or at least four years of professional-level experience and a Bachelor’s degree. SPHRi (Senior Professional in Human Resources (International) is the highest certification you can earn from the HR Certification Institute and requires you to have 4-5 years of professional-level experience with a Master’s degree, or at least seven years of professional-level experience and a Bachelor’s degree. SHRM-CP (Certified Professional) is a great certification for those with a Graduate degree and one or fewer years in an HR-related role, a Bachelor’s degree and at least one year in an HR-related role or no Bachelor’s degree and at least three years in an HR-related role. SHRM-SCP (Senior Certified Professional) is the highest certification you can earn from the SHRM certification and is available to those with a Graduate degree and three years in an HR-related role, a Bachelor’s degree and at least four years in an HR-related role, or no a Bachelor’s degree and at least six years in an HR-related role. Choosing the right HR certification will depend on your career level and education, but starting with an aPHR can help you begin expanding your career opportunities even if you’re new to the industry. While opting to complete a certification may require you to commit time outside of work, the benefits you’ll enjoy will make it a worthwhile investment.